Coloring Books for Adults, Anyone? Years ago wifey purchased something I never knew would be of interest to someone her age. It was a box of crayons and a coloring book along with it. What I find funny is that it was way back when we do not have Marcus around yet. Knowing wifey as someone who seldom spends on anything unnecessary—either by choice or not—I let her grab her art stuffs because for an employed adult these are cheap anyway. While at some point in my elementary days I wished that I also possess a box of crayons with built-in sharpeners, I have let go of the thought as soon our art subject is over. But for wifey, age didn’t matter. I do not consider my wife as someone who is really into arts so I was thinking all along that she would soon ditch the crayons as soon as we reach home that day. I was wrong. She did manage to spend time coloring the book as if it will be graded by a teacher. In my opinion, she rendered the colors well. She also made sure that her crayons are all in proper order after each use and that anything that starts to dull gets sharpened. Her crayons remained almost pristine until the day someone came into the picture. Our kid eventually took over wifey’s 48-color Crayola. And I know that she had some reservations giving the crayons due to the fact that she knows the fate of Marcus’ basic crayon set. Some got stripped of labels, some broken in half, and some lost in the Kindergarten battlefield. Some made their mark on our wall—thanks to baby oil, these got erased easily. Today The Guardian released an article Colouring books for adults top Amazon bestseller list and it made me discover that wifey isn’t alone. 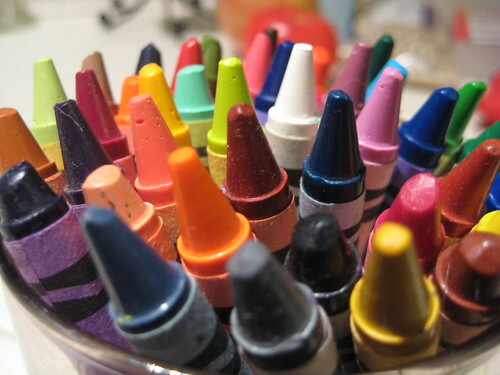 Surprisingly, there are also others who are into crayons and coloring books regardless of age. (Whew!) Now I wonder if it is a good time to buy a Marvel coloring book. Nope, not for wifey. Not for Marcus either. You know, it does not hurt to start all over again. This Monday we heard a very surprising news, one so unlikely, when we picked Marcus from school. I got off from the car and approached two anxious faces–the assistant teacher and school director–looking after our kid as he does his usual end-class playtime. And I my gut feel proved itself right when the school director walked with me and Marcus back to our parked car. “What’s the news? What were you discussing with Sir Ric?” asked my wife who was waiting inside the car. “How’s school Marcus?” she added a cliché question as Marcus settles down at the backseat. The next thing my wife heard struck her just as it did to me. To display some bullying is the least of the things we expect to hear about our son. The news was just unbelievable. There were some serious exchange on our drive back home.